Your right to privacy and data security is important to us. Customer information that you provide will remain confidential at all times. We do not sell, rent or disclose any information about our customers to other parties. Periodically, we may send you information about our products and services. If, however, you prefer not to receive such offers or information, just send us an email. 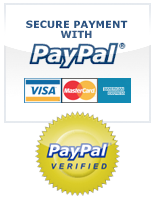 We are a Paypal verified online store and your order is process with the highest level of encrypted security protection via paypal payment processing. If you use this site, you are responsible for maintaining the confidentiality of your account and password and for restricting access to your computer, and you agree to accept responsibility for all activities that occur under your account or password. Unauthorized use of this Web site, including but not limited to unauthorized entry into our system, misuse of passwords or information is prohibited. RUNOLUTION BOUTIQUE WILL NOT BE LIABLE FOR ANY DAMAGES OF ANY KIND ARISING FROM THE USE OF THIS SITE, INCLUDING, BUT NOT LIMITED TO DIRECT, INDIRECT, INCIDENTAL, PUNITIVE, AND CONSEQUENTIAL DAMAGES.